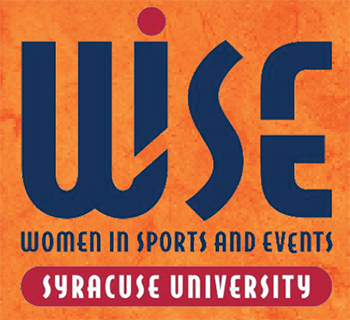 Women in Sports and Events (WISE) will host “Shoot for Success: WISE Women in Sports,” a pre-game panel discussion on Sunday, Feb. 19, at 2 p.m. in the Carrier Dome. Organized in collaboration with Syracuse University Athletics, the panel discussion will take place before the SU women’s basketball team tips off against Notre Dame at 5 p.m.
For more event information, and to register, contact sport management internship coordinator and WISE co-advisor Nicole Imbrogno, at nfimbrog@syr.edu. There is no cost to register for the event, but guests must have an SU women’s basketball game ticket to attend. To purchase game tickets, visit www.cuse.com/tickets (Syracuse University students are free with SUID). The Syracuse University chapter of Women in Sports and Events—the first collegiate chapter in the nation established in Falk College’s Department of Sport Management in 2009—includes women from all majors interested in pursuing careers in sports and events. The organization, which meets on Tuesdays from 6-7 p.m. in 441 Falk, promotes professional development and civic engagement.